Hey there, first I wanted to say that this was a lot of fun to be involved in and I tweeted that it was nice because I would not have the ambition to take the time to make something this nice for my shop as when in the shop I am usually working on money projects. The materials used were all scraps I had in my shop from previous projects and I had thought this as my original design though I never made plans I just winged the whole thing. 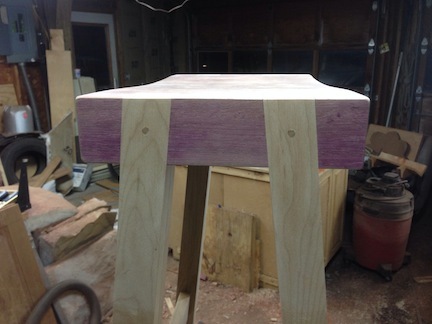 The seat is purpleheart which was 3″ thick and my planer is not big enough to run it properly so that was my first challenge to bring it to a more acceptable thickness as it is also really heavy! I brought it down to 2.125″ and decided enough was enough. The legs are cherry from a 8 foot leftover that had a lot of sapwood in it so it wasn’t as usable for most projects where cherry was wanted. The legs are 1.5″ square after gluing up. I then inserted 2 cherry stretchers and 2 padauk stretchers the cherry is mortise and tenon and the padauk is through mortised. The next challenge was that I had not done all handmade mortises before and even though I was behind a little I was determined to do it. Not even cheating with a drill to remove most of the material. The through tenons were a little looser than I liked so I pinned them through when I pinned the legs to the seat. In the supplied pictures you can see the curves I introduced on the top, bottom and sides of the top to add a little more visual interest. 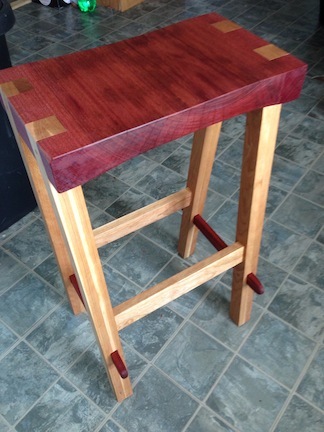 Thanks to a couple fellow tweeters I decided to go with a stub of the padauk extending from the legs to add another option for feet or to rest materials on if needed. hi this is amazing work… great job! Way to go! Super! The Purple Heart really shines! Beautiful stool.